All Radiation Therapy Is Not Created Equal. The oncology landscape has shifted, and now there’s an opportunity to treat cancer with more advanced techniques. RapidArc Rotational Radiation Therapy brings together the most sophisticated technologies in a treatment which significantly reduces treatment times and radiation exposure for the patient. RapidArc technology from Varian Medical Systems, the world leader in radiation research and development delivers radiation often in less than 90 seconds per fraction, creating a smoother, more highly shaped radiation treatment that is unlimited in its sophistication. It takes precision delivery and targeting to the next level. 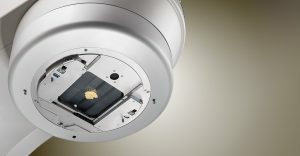 RapidArcTM radiotherapy technology from Varian Medical Systems is a major advance in radiation treatment that improves dose conformity while significantly shortening treatment times for some types of cancer. During a RapidArcTM treatment, radiation is shaped and reshaped as it is delivered continuously from virtually every angle in a 360-degree revolution around the patient. This precise continuous single rotation beam reduces not only the treatment time, but also the dose to the surrounding organs. RapidArcTM avoids using multiple fields and treatment setups so the patient faces less discomfort and disruption. This helps lower the stress of treatment and allows them to quickly resume their daily activities and lifestyle. Treatments can be delivered in less than two minutes, which is two to eight times faster than older forms of intensity-modulated radiation therapy (IMRT) and faster than helical IMRT. RapidArcTM delivers precise treatments to match the tumor size and location, sparing the surrounding healthy tissue. RapidArcTM uses a unique Varian algorithm that provides exceptional treatment delivery control, resulting in improved dose conformity for greater normal tissue sparing and tumor. How does RapidArc Image Guided Radiation Technology Work? What Types of Cancers are Treated with RapidArc Image Guided Radiation Technology? Of course, most cancers benefit from treatments that are more accurate and precise. Tumors of the brain, head and neck region fare well when treated using IGRT because the technology ensures that the delicate tissues, such as the spinal cord and salivary glands, remain away from the high dose region. Radiation derives a significant benefit from RapidArc Image Guided Radiation Technology. As the bladder fills and empties, the prostate gets pushed and pulled and will be in different positions for each day of radiation treatment. With RapidArc the physician is able to precisely target the prostate, avoiding unnecessary damage and side effects. Breast cancer treatments benefit from RapidArc Image Guided Radiation Technology by taking the breathing motion into consideration, and decreasing doses to the underlying sensitive tissues and organs, such as the lungs and heart. 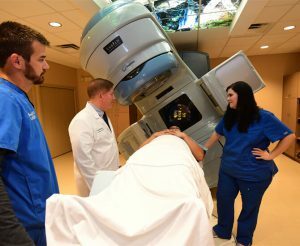 Lung Cancers are tracked using a form of Image Guided Radiation Technology that tracks a tumor using 4-Dimensions, allowing our physicians to know the location of the lung tumor despite its constant moment-to-moment movement. IGRT can ensure that the head and neck position is so precise that doses to the spinal cord and vital organs can be significantly reduced or eliminated.